America's cities are the beating heart of its economy and culture. The U.S. Census Bureau recently released their annual population estimates for 752 cities and towns across the country with at least 50,000 residents. Using that data, Business Insider found the city in each state with the highest percent change in population between July 1, 2015 and July 1, 2016. Two states — Vermont and West Virginia — had no cities with at least 50,000 residents. In three states — Alaska, Hawaii, and Delaware — every city of that size saw its population shrink over the year. Those five states are excluded on the map. 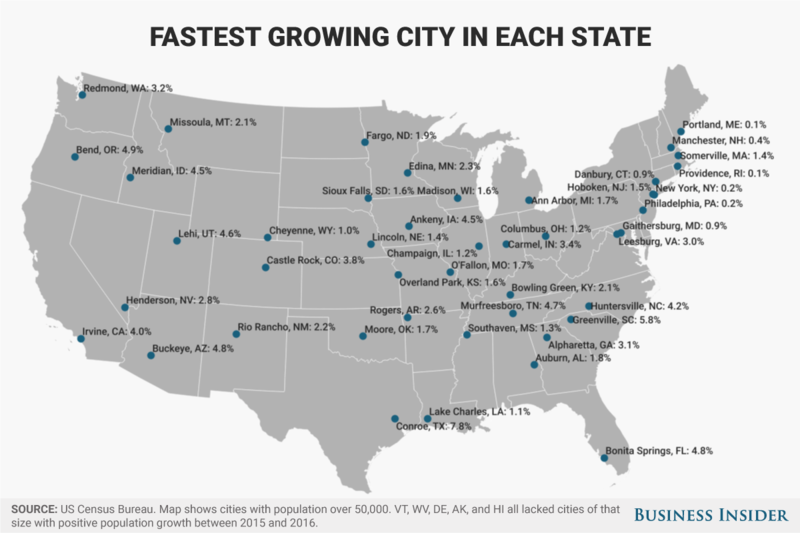 Here's the fastest growing city in each of the other 45 states, along with the percent change in population between 2015 and 2016.